I've mentioned my love of pumpkin before and pumpkin pie is a great way to enjoy it. But pumpkin pie isn’t just for Thanksgiving, is it? 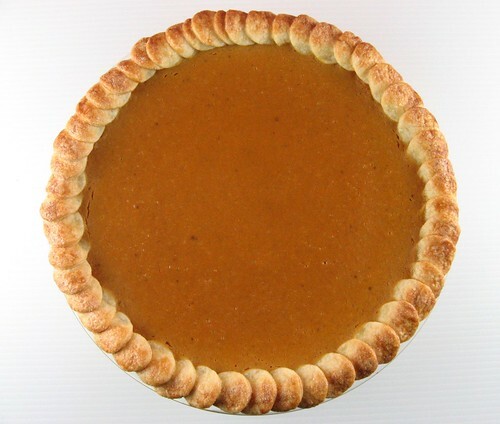 I like baking pumpkin pies all year round, but mostly from Halloween through the New Year. Especially when it's combined with aromatic spices. In addition to the usual cinnamon, I always like a healthy dose of ground ginger in my pie. 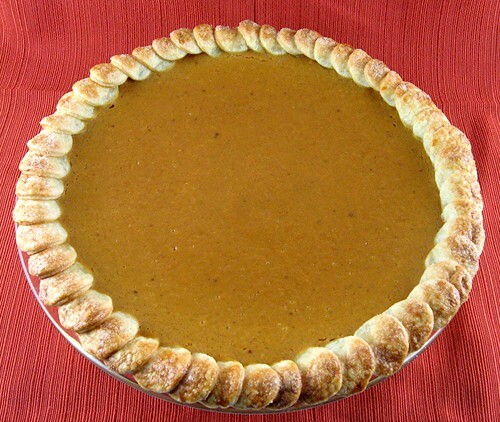 This pumpkin pie was on the cover of November's Fine Cooking magazine. I really liked the use of heavy cream instead of canned evaporated milk in the pumpkin pie filling. The custard filling seems smoother and, in my opinion, filling made with heavy cream just tastes better since it doesn't have that "cooked-canned" taste that the evaporated milk can impart. Although I wouldn't turn down a slice of pumpkin pie just because of the type of dairy used. In a small bowl, stir the salt into 1/3 cup very cold water until dissolved. Put the flour in a food processor and scatter the butter on top. Pulse until the mixture forms large crumbs and some of the butter is in pieces the size of peas, about 8 pulses. Add the salt water and pulse until the dough begins to come together in large clumps, about 7 pulses. You'll still see some butter pieces. Shape the dough into a 1-inch-thick disk, wrap in plastic, and chill for at least 1 hour or up to overnight. On a lightly floured surface, roll the dough into a circle 16 inches in diameter and 1/8 inch thick. Transfer to a 9-inch ceramic, metal, or glass pie plate, easing the dough into the bottom and sides and then gently pressing into place. For a traditional crimped edge, trim the overhanging dough to 1/2 inch from the edge of the plate. Fold the overhang under and crimp decoratively. (Or you can make the fancier edge decoration with the trimmings.) Wrap and refrigerate for at least 30 minutes or up to overnight, or freeze for up to 2 weeks. Position a rack in the center of the oven and heat the oven to 400°F. Line the chilled pie shell with parchment and fill it with dried beans or pie weights. Bake until the sides have just set and look dry, 16 to 20 minutes (lift the parchment to check). Remove the weights and parchment and bake until the edges are light golden and the bottom is pale and completely dry, about 5 minutes. If the dough starts to bubble while baking, gently push the bubbles down with the back of a spoon. Let the crust cool completely on a wire rack before filling. Heat the oven to 325°F. In a large bowl, whisk the pumpkin, eggs, egg yolk, cream, and vanilla. In a small bowl, mix the brown sugar, cinnamon, ginger, salt, nutmeg, pepper, and cloves. Whisk the sugar mixture into the pumpkin mixture. Pour the filling into the cooled piecrust. Bake until the pie is set around the outside but still slightly wet and jiggly in the center, about 1 hour. The filling will continue to set as it cools. 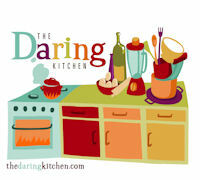 Let the pie cool completely on a wire rack and then refrigerate for at least 2 hours and up to 2 days before serving. What a lovely looking pie I really like the leaf edging. Yes cream is better since it gives a smoother result. ...and everything nice, that's what little girls are made of! :-) That crust is BEAUTIFUL! Great job. a classic! love the crust and the spices - balck pepper! Wow, this looks like belongs in a magazine too. Awesome crust... very inspiring. That pie looks nice and creamy. I wish I could have a slice! 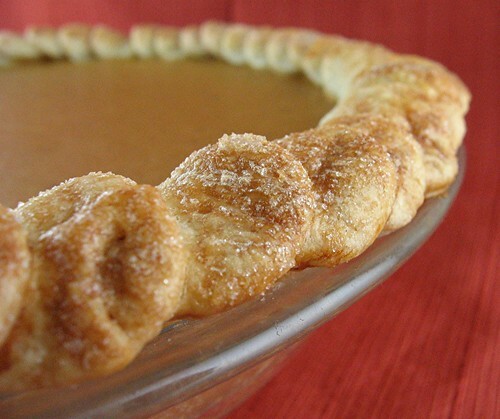 I've never had homemade pumpkin pie and I'm sure the storebought kind is no comparison. That's a really pretty pie; bet cream made it wonderful!! !